These are the conferences and shows I attended or will attend starting at spring 2016. I’ll keep the list up to date and link to session material or videos whenever possible. Session: The talk with Benjamin Abt and me was an introduction to Azure DevOps. I have two talks: one is called “From 0 to DevOps” and it is about what DevOps is and how you should approach it in your company or team. The second talk is called “Continuous Delivery with FeatureFlags”. This time I will give a none technical talk called “Das Karriere-Zen für Software Entwickler”. It is about how to approach your career as a developer to be successful and happy. I give my talk “Clean Code is Team Sport” and describe the correlation between clean code and technical debt and how you can enforce it on a team or organization level. Together with Neno I organize the Global DevOps Bootcamp in Cologne. The topic this year is: “From once a month to multiple times a day”. The event is free – you can register here if you want to join. Together with Benjamin Abt we show you how you get ASP.NET Core Apps on Docker and Kubernetes from Code to production with VSTS. I talked about Feature Flags in practice: control runtime behavior instead of duplicating code. The talk was about LaunchDarkly and FeatureSwitcher with the new VSTS Plugin. Together with Benjamin Abt we showed you how you get ASP.NET Core Apps on Docker and Kubernetes from Code to production with VSTS. My session was about Continuous Delivery with Feature Flags. I also had a Session and a half day Workshop with my colleague Benjamin Abt. We showed you how you get ASP.NET Core Apps on Docker and Kubernetes from Code to production with VSTS. I talked about continuous delivery with feature flags and LaunchDarkly and VSTS. I helped at the Golab DevOps Bootcamp from Agile Munich. I will talk about clean code and technical debt. The talk is about managing technical debt with SonarQube. I talked about DevOps on the Microsoft DevOps platform for any language and any platform. I spoke about software design for DevOps organizations at the Technical Summit. The approached the DevOps topic from the developer perspective. I talked about software design and design patterns, micro services, container (Docker and Service Fabric) and how it all plays together to build a release pipeline that enables teams to deploy 100 times per day to production. I wrote a post about one of the demos I did. I talked about agile fixed price projects with Scrum and Prince2. In the session I will explain how you can use management frameworks like scrum and prince2 to deliver fixed price projects in an agile way. I talked about DevOps in general at the 45. ScrumTisch Stuttgart. I spoke about software design for DevOps organizations at the Basta! conference. The talk approached the DevOps story from a developer perspective. The session was about software design and design patterns, micro services, container (Docker and Service Fabric) and how it all plays together to build a release pipeline that enables teams to deploy 100 times per day to production. I spoke about software design for DevOps organizations. The session was recorded and is available on channel9. In the session I explained how you can use management frameworks like scrum and prince2 to deliver fixed price projects in an agile way. I had two session. The first one was about software design for DevOps teams. The second was about how you have to change the way you build PowerShell scripts if you want to treat infrastructure as code. 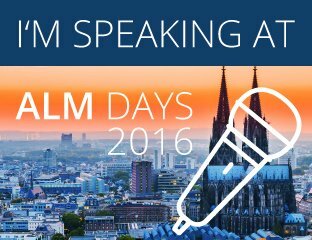 I was guest in the TechTalk ALM Series with Daniel Meixner. In episode 66 we talk about the new Release Management in Visual Studio Team Services (VSTS) and TFS 2015.2. In episode 65 we talk about Buil.VNext – the new build system in TFS 2015 and Visual Studio Team Services. In episode 64 we talk about professional development of PowerShell with Visual Studio, GitHub and Pester.